Brendan Maher is a feature editor with the news team at Nature. He has been editing life science news and opinion for more than a decade both at Nature and formerly with The Scientist. He has a degree in writing and biology from Loyola University (f.k.a. Loyola College) in Baltimore, Maryland, and now lives in Piscataway, New Jersey. Jennifer Rainey Marquez joined Parade magazine in 2011 as senior health and features editor. She is responsible for developing and overseeing all health and science coverage, from weekly columns to cover stories. Prior to working at Parade, she was the senior health editor at O: The Oprah Magazine, where she produced the monthly “Feeling Good” section, in addition to well features on disease prevention, nutrition, fitness, weight loss, and psychology. She has also served as senior health editor for Women’s Health and Woman’s Day magazines. She holds a journalism degree from the University of Georgia. Ron Winslow is the New York-based deputy bureau chief for health and science and a veteran medical reporter at the Wall Street Journal. He was awarded the 2011 Victor Cohn Prize for Excellence in Medical Science Reporting. Winslow was cited for the “exceptional breadth, precision and clarity of his coverage about how technological innovation is transforming the world of medicine.” Winslow began his journalism career 40 years ago as a reporter for Rhode Island’s Providence Journal, and later, while teaching English and journalism at the University of New Hampshire, continued to write as a freelancer for The New York Times and the Boston Globe magazines among other publications. He joined the Wall Street Journal in 1983 as a reporter. Two years later he was named assistant national news editor, in charge of the paper’s science and energy section, and a few months later, news editor. He returned to reporting as a senior special writer in 1989, covering healthcare and medicine. He subsequently also served as health and science news editor of the paper, before his appointment in 2008 as deputy bureau chief for health and science. His work has been recognized by the American Heart Association and the National Alliance for the Mentally Ill.
Susan Gilbert is the public affairs editor of The Hastings Center. 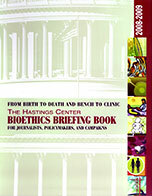 She is also editor of Bioethics Forum, the blog of the Hastings Center Report and a contributing editor to the Report. Before coming to the Center, Gilbert was a freelance writer and editor. She was a frequent contributor to The New York Times Science section and an editorial consultant for Harvard Health Publications. She was previously an editor of The New York Times Good Health Magazine and Science Digest. Gilbert is the author of A Field Guide to Boys and Girls (HarperCollins 2000) and coauthor of The Harvard Medical School Guide to Optimal Memory (McGraw-Hill 2005) and Children’s Hospital Guide to Your Child’s Health and Development (Perseus 2001). She has received two awards from the American Medical Writers Association.